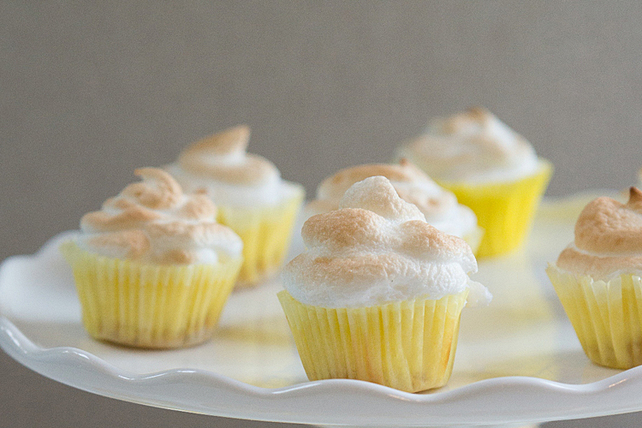 Part cheesecake, part lemon meringue pie - these Lemon Meringue Cheesecake Minis combine the best of both desserts into bite-size citrus treats. Mix cookie crumbs and butter; press onto bottoms of 24 paper-lined mini muffin cups, using about 1/2 tsp. for each. Beat cream cheese, 1/4 cup sugar, corn starch, lemon zest and juice in large bowl with mixer until blended. Add whole egg; beat on low speed just until blended. Spoon into muffin cups, adding about 1 heaping tsp. batter to each. Bake 13 to 15 min. or until centres are almost set. Remove from oven. Increase oven temperature to 400ºF. Beat egg whites and cream of tartar in small bowl with mixer on high speed until foamy. Gradually beat in remaining sugar until stiff peaks form. Spread onto cheesecakes. Bake 5 min. or until golden brown. Cool completely before removing cheesecakes from pans. Refrigerate 2 hours. When topping the warm cheesecakes with the meringue mixture, be sure to spread the meringue all the way to the sides of the muffin pan cups. This will help prevent the baked meringues from shrinking. Use back of spoon to swirl tops to form peaks, then continue baking as directed.